After years of being regarded as a regulatory tool, spatial planning is now a key agent in delivering better places for the future. Dealing with the role of spatial planning in major change such as urban extensions or redevelopment, this book asks how it can deliver at the local level. Setting out the new local governance within which spatial planning now operates and identifying the requirements of successful delivery, this book also provides an introduction to project management approaches to spatial planning. It details what the rules are for spatial planning, the role of evidence and public involvement in delivering the local vision and how this works as part of coherent and consistent sub-regional approach. The conclusion is a forward look at what is likely to follow the effective creation of inspiring and successful places using spatial planning as a key tool. 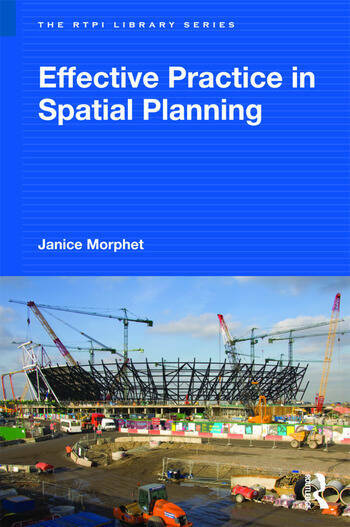 Janice Morphet is a Visiting Professor at The Bartlett School of Planning, UCL. She is also a member of the Planning Committee of the London 2012 Olympic Games. Janice spends much of her time as an academic and practitioner working on spatial planning and its interrelationships with local governance.